Lodge 472 Hoedspruit is a well-established self-catering unit ideally situated in the Hoedspruit Wildlife Estate, which is a beautiful conserved part of the Lowveld bushveld with free-roaming impala, kudu and warthog grazing between the houses. The secure wildlife estate is located on the edge of the town of Hoedspruit, with all amenities within a ten minute drive from the estate. This self-catering lodge can accommodate up to four guests and contains one bedroom downstairs, a loft bedroom upstairs, and an open-plan lounge and kitchen area. The main bedroom contains a double bed, and there are twin single beds in the loft-room. A small splash pool will cool you down and wash of all the stress related to todays rushed lifestyle. Sit on the patio while listening to the noises in the bushes while sipping away on your favourite drink. An outside braai and fire pit also bring you closer to the bushveld, with warthogs coming to visit and sometimes drink from the pool. A very relaxing holiday in a wonderful setting. We really enjoyed staying there, its comfortable, peaceful, clean, and lots to do in the area. Thank you!! 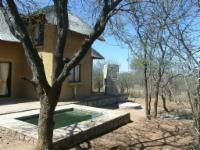 Lodge 472 Hoedspruit is 5.9km from the centre of Hoedspruit , the nearest airport 7.3km (Eastgate Airport).